AI and Automation is still at the forefront of so many conversations that business leaders are having. And the core issue that continues to be the main focus of these conversations is whether we are going to create more jobs than we replace or vice versa. I have a different concern when it comes to AI and Automation. My concern is, are we going to create jobs that people actually want. What if we are able to create enough new jobs to make up for those replaced by technology, but they are jobs that people hate. What if they are jobs that make people feel like cogs? What if these jobs leave them feeling disengaged or undervalued? Are these jobs worth creating? So the conversation I think we need to be focusing on now is, how do we create new jobs that people actually want to have? Let me know what you think, comment below to share your thoughts! You can subscribe to the YouTube channel for more videos. My new book, The Employee Experience Advantage (Wiley) analyzes over 250 global organizations to understand how to create a place where people genuinely want to show up to work. Get my free training series to create powerful Employee Experiences, or become a member of the new Facebook Community The Future If… and join the discussion. 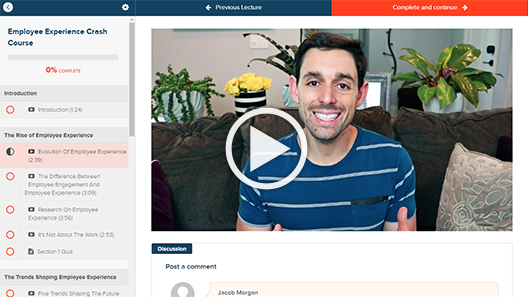 Copyright © 2019 – Jacob Morgan Inc.
Get started on our FREE training series!